Trondheim is rich in history. Taking a walk down its streets is like stepping back into the Middle Ages. The symbol of Trondheim is the rose. The five-leaf rose has been used as the city seal since the 18th century. The city was founded in 997 by Viking King Olav Tryggvason. It was the capital of Norway from 1030 to 1217. Visiting the city there are certain places that tourists must see. Nidaros Cathedral is the national sanctuary of Norway and was built over the grave of St. Olav. Work on this cathedral started in 1070 and extensive restorations in 1869. The cathedral is yet to be completed. It counts as the most important Gothic monument in Norway. The Archbishop’s Palace is one of the best preserved building complexes of its kind in Europe and is the oldest secular building in Scandinavia. It was the arch bishop’s residence until the Reformation in 1537. In the west wing you’ll find The Norwegian Crown Regalia exhibition, the Army Museum and the Resistance Museum. In the south wing is the Archbishop’s Palace Museum where visitors can see original sculptures from Nidaros Cathedral and archaeological finds. It is interesting to see the Archbishop’s mint where the coins are stamped just like they were found by archaeologists. The Museum in the Manor House – in this Swiss-style building you can see instruments from the European musical tradition. The Museum in the Barn features modern sound and light technology. For all of you rock and pop fans there’s Rockheim. This is Norway’s center for pop and rock music and Trondheim’s newest attraction first opened in 2010.It’s located in a building in the harbor area. Literally Rockheim means “the home of rock”. It showcases the best of popular Norwegian music from the 50s to the present. There are exhibitions, interactive displays and concerts. A restaurant provides views of the city. Stiftsgarden is the Royal Residence. It was built during 1774 and 1778 and is the largest wooden palace in Scandinavia. It was sold to the Norwegian State in 1800 and is now the official Royal Residence in Trondheim. Sverresborg-Trondelag Folk Museum – This is an open-air museum of cultural history around the ruins of King Sverre’s medieval castle. 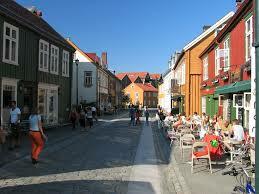 There are wooden buildings and scenes from Trondheim and Trondelag. Lovely indoor exhibits like Images of Life showing life in the region in the last 150 years and the theme theater The Tronder Bride. Lots of activities are offered for children.